Great post Lydia! I agree about Bridge to Terabithia! An epilogue or something would have been nice. Did you watch the movie of it? Thank you. No, I’ve never seen the film. Was it good? Yes, I think I cried at the end😍 So heartbreaking, yet beautiful. Well, now I definitely have to watch it then. I wouldn’t mind reading more of Starr’s story either. And Coraline! I have so many questions about that one. Great list! Thanks. Yeah, there were a lot of things about Coraline that were never fully explained. You mentioned so many of the books I love! I adore Bridge to Terabithia and The Hate U Give. You are absolutely right. We need to find out what happens to these characters! Yes I’d love to see a sequel to THUG! Speak was so good! I think Shout is supposed to be a sequel? I’m not sure, I just know it’s related. Whoa, there’s a sequel for that book?! That is so cool if true. I had no idea. I LOVED Speak and Bridge to Terabithia BROKE me. I don’t know if I could take more of either of them due to such emotions– BUT if there were sequels to them, I’d probably be one of the first in line to get them! Thank you. I hope you love that book. 100% would read a sequel to The Hate You Give. I feel like there is so much she can do with those characters! I know, right? You hit the nail on the head there. 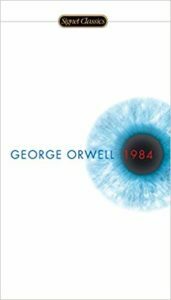 Oh, I’d love to see a sequel for 1984. It would go well with the current political climate we’re in. I haven’t actually seen the film yet, but the book was so good I’m hoping to soon. Glad you enjoyed the film version! I have THUG on my list. The fact that you want a sequel makes me even more excited to read this one! This is a great list. Based on your desriptions they all seem to have similar types of endings. I hadn’t thought of that, but you’re right! They do have similar types of endings in a lot of cases. I think a sequel for Speak could be very interesting. Aw, just seeing Bridge to Terabithia on your list brought back a flood of happy memories. Great list! A sequel for THUG would be wonderful I still need to see the movie. I haven’t seen it yet either. Hope we’ll both get to soon. I definitely agree about the Hate U Give. It would be interesting to see what happens next with the characters, even if it’s 5 years later or something. How does Starr use that tragedy to shape her life? And I never even thought about a sequel for Bridge to Terabithia but I can see how that would be interesting as well! Thank you very much. I think Starr was forever changed by the events in T.H.U.G. The Hate U Give is a good one! Thanks. So glad you think so. I could do with a Coraline sequel. I only had 5 and like you, I agree that there are plenty of series and sequels out there. A Coraline sequel would be fun for sure. Thanks for stopping by. Catherine Called Birdy sounds like a fascinating read even without a sequel. Oh, it was a great read. 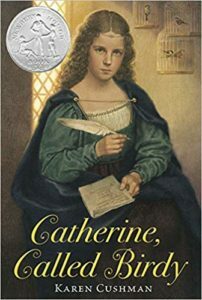 I highly recommend it if you like middle grade historical fiction. A Coraline sequel would be so interesting – not necessarily following Coraline but maybe like other kids that got into the other world? That would be such an interesting spin on that world. “1984” has the darkest ending I can think of. But this is what I love about “adult” dystopia. The protagonist isn’t on a mission to overthrow the regime, they’re just trying to survive, and stay true to themselves. Coraline? I’ve seen it on several lists and to be honest I don’t remember the ending. My bad. Thanks for dropping by my blog. You’re welcome. Coraline is a great story. You should definitely read or watch it again. Nice picks! Mostly all new to me ones here! I’ve heard of most of them of course! Lol. You’re welcome. Thanks for stopping by yourself. We have two of the same books! And you’re right on about The Hate U Give, I’d love to see Starr’s future! Yay! It’s always fun when that happens. Here’s hoping we get a sequel to T.H.U.G. soon. Great list! Oh I’d LOVE another book set in the block of flats in Coraline; that was such a fun, eerie setting. Yes, it sure was. And thanks. Ha, I love that we both had 1984 on our lists! 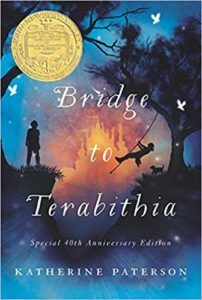 I would love a sequel to Bridge to Terabithia, too. With such a magical (and tragic) childhood, I’d love to see what becomes of the children and how they cope if their children find their own bridge, etc. I couldn’t agree with you more. Thanks for stopping by. I really need to re-read Bridge to Terabithia and a sequel set years later would be interesting considering the way that Paterson writes about the way we cope with the hard things of life. I couldn’t agree with you more there. 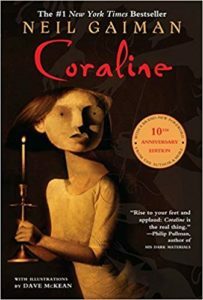 I’ve only read Coraline off your list – and you’re right it would be good to explore further. I’ll check out some of these other books. The Hate U Give has very good reviews and so I’ve got my eye on that one as it is. 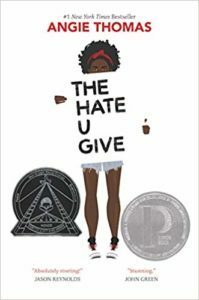 The Hate U Give is fabulous. Hope you like it! Yeah, I can’t blame you for that at all. It wouldn’t be pleasant in all likelihood. Yes, I do agree that there are too many sequels out there in general. I hope we get another glimpse of Coraline’s universe someday. Wow, Catherine, Called Birdy is SUCH a throwback for me, but it’s so good. I love that book. Thanks for stopping by! You’re welcome. It’s nice to meet another fan of it. I haven’t yet read The Hate U Give, but the movie was so wonderful — and yes, I agree, I need to know more about Starr. I just finished On the Come Up and that’s another of her books that is making me want more! I’m so glad you loved the movie and On the Come Up. I really need to check them out sometime soon. It’s always interesting when that happens! The only book off this list that I’ve read is Speak, and it’s been years. I still want to read THUG, hopefully soon. Great list! Thanks. I’m glad you liked it, and hopefully you’ll get to read THUG soon. I’d love to see more of Coraline! Great choices! Great list. A Coraline sequel could be really interesting! Coraline’s interesting! I’ve never read Gaiman but I should- and his Neverwhere is one I’ve been interested in, along with Stardust. Gaiman is a fabulous author. I think you’d really like him, Greg. Great picks! Coraline would be great! I love that book, and the movie for that matter. Not sure if I could handle anymore Terabitha – my poor heart ! Yeah, that makes sense. It would definitely require a big box of tissues! A Coraline sequel would be AMAZING. I just finished reading it for the first time and really enjoyed it. I am in love with your list! First off, we both included Speak which is great, but secondly it is so great to hear mention of Catherine, Called Birdy. I loved that book and it would be super fun to revisit her story in a sequel. I remember being so impressed and in awe about how candid she was. Bridge to Terabithia would be really interesting to read, especially how all of the events of that period of his childhood impacted him later on. As for 1984, as interesting as it would be…I think I’d be too scared how horrifying that sequel could be! So glad to hear that. What a nice compliment. It sounds like we have very similar taste in books. Do you think there could ever be a way for a 1984 sequel to be more upbeat? I’m not sure if there could be…perhaps we could see things from Julia’s perspective instead? Or looking into an underground society of rebels? That would be such a cool take on the topic. I have THUG on my TBR. Good you know it is so great that it needs a sequel. Yes, it sure does. Happy reading! I sequel to Speak would be good… just to check in on her. The Hate U Give! Yes! I didn’t think of that, but if its sad and people die I dont want it. I don’t want to give away spoilers, so all I’ll say in response to this is that The Hate U Give might not be the book for you. It’s good you know exactly what you do and don’t want in a story. I loved Catherine, Called Birdy when I was growing up. Excited to see it mentioned here. It would be great to see a sequel. So glad to hear that. I wasn’t expecting so many people to remember it. Cool! This is a fabulous list of books. Speak has always been on my list of books that completely took my breath away. Such a powerful story. Honestly, though, I’m not sure if I like the idea of a sequel to books like Speak that I have loved. I am afraid that most of the time a sequel spoils a book. I need to reread Catherine, Called Birdy! I loved that book so much when I was in elementary school and read it so many times, but I don’t remember it at all anymore. I hope you’ll get to do that soon. So glad you loved the movie. I really need to watch it one of these days. Great list! Speak would be on my list too if I did this topic! Love Coraline too. Thank you very much. I hope I’ll see you around on future TTT posts. With you on Speak. 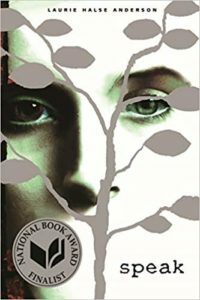 I loved that book and I’d love to see how she came through it all a few years later. The only one I have read is The Hate U Give, but I would LOVE to see Starr pop up in one of Angie’s future books, so we can kind of check in on her, you know? Maybe it’s a few years later, so we get more of her future story? That would be perfect! Totally agreed. Even a scene or two would be lovely. Seeing more on the overal flat of Coraline would be interesting, yes. 🙂 And the cat. I want more of the cat haha. Ohh great post and great picks in book I was so going to pick Coraline as well for my TTT post I absolutely loved and enjoyed that book too. Thank you so much for stopping by my TTT post last week. Thank you very much. What a nice compliment. And you’re welcome. I definitely agree with you about Coraline. I’ve got so many questions and now that you’ve mentioned yours I know I’ll be thinking about this for a while. Great post! Aww, thanks. Yeah, that book left a lot up to the reader’s imagination in a good way. Thanks so much for visiting Finding Wonderland last week, Lydia. Apologies it took me this long to circle back here. You’re quite welcome, and no worries. Sometimes life gets busy.